Super useful to know this. And you should know it like you know the alphabet. Here’s a silly way of learning it in about a minute. You will need to know: a blues, the devil’s interval, a word. The first and last bits are chords you will know from the blues: I IV V, C F and G. If that’s familiar then great, we’re off. 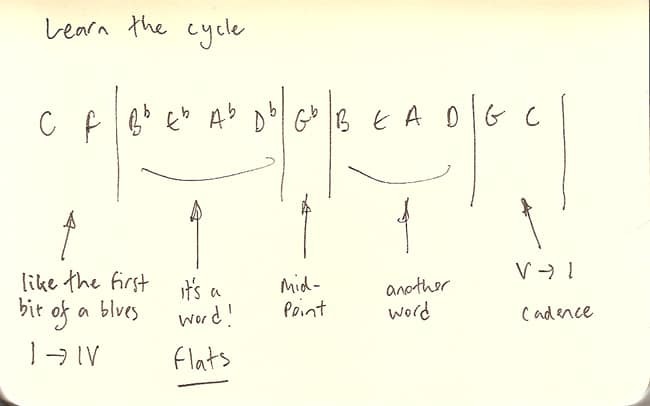 The first two notes in the cycle are like the first bit of a blues: C to F. The last two notes are like the last bit of a blues, or a perfect cadence V I, G to C.
The mid point from C to C is a Gb. It divides the octave exactly in half. If you’re familiar with Metallica or West Side Story, you’ll know the sound of this interval. Anyhow, for now all you need to know is it’s Gb. The other parts form the word BEAD. The first bead you encounter is all flats: Bb Eb Ab Db. The second one is just natural notes BEAD. Get it so you can say this in about 3 seconds. The movement of 4ths is really common in chord progressions, II V Is, for example.